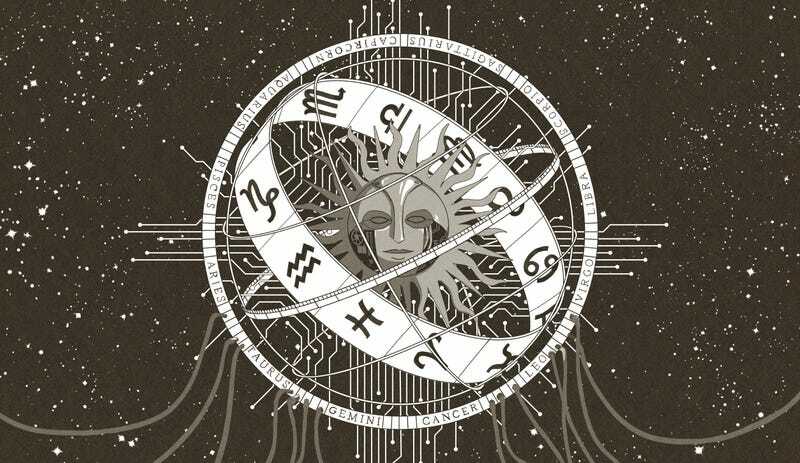 Welcome to AIstrology. With the help of research scientist Janelle Shane, we developed a bot to generate monthly horoscopes. Its language faculties will be tweaked and trained as time goes on. Sometimes they may more closely resemble human syntax, and other times, well... less so. There is a desire, granite smooth but yielding. We wish to go back to the stars! Today the day has come. Back now, and pleased to be of use. Might this new month bring the fortunate ones to your door. The weather has been cold and at least a bit a little warm, and days are busy with work, so let’s get ready! There’s a new on-going concern to keep our little Observatory fresh at hand! It’s been a while since the first report of a storm or event that’s left Unsealing Town. And, with that, we’re going to investigate a certain level of moisture. Just today afternoon, a warm midday was expected. As you’re probably familiar with, this could be a sign of a significant wind chill, but it might also be a sign that your body has formed a protective thin layer of moisture. We’re calling that “grey moisture.” It’s only about the amount of yellow and green you’re imagining, but it’s a significant amount of grey! If you’re lucky, you’ll end up thinking of your children doing better in their younger years. Maybe the sun will set down in a big way, or maybe your house will start to cool down. But this is a good time to think about how you could fill in the number of old problems with new ones, and how you could take on a new challenge with a new outlook on life. It’s a long, emotional week ahead of you, especially for days like this. You’ve had so many mysterious and unusual things happening lately, but you’re not really sure any of them are your fault. Maybe they’re your fault, maybe they’re part of what’s happened to you. Maybe they’re the reason your life has become so dizzying, or maybe your peers have left you out. Maybe it’s all your fault, maybe you’ve got to get out of here. Whatever it is, let it come to you at last. You’ve got to get out of here. Maybe you should just go out and fix it. Put the lights up, put the half-baked stereo out, and set it down here on the roof, just so it will look better on the outside. I mean, you’re the one with an ill-fitting pair of shoes, and a trembling hips, and your back will probably take a hit—and maybe you even might even be able to get yourself out of this situation. But you’ve probably got the knock-off: you’ve been out on the property, and the sun is starting to set on you, and the time is ticking away at three on the morning of that first hot day. Moon, a tiny yellow planet, orbiting your moon at a very short distance of 4 minutes on all sides and then you will get an extra day or two out of there before it changes direction due to a lack of light, a very big issue for Earth where you will need some help getting things moving in a new direction or a new destination. Your favorite weather pattern has come to you. Your family’s and friends’ favorite seasonal fruits and beverages come and go; you always need the same, even when they’re different, which is your own thing that gets you to your best time. If you’re feeling some of those “laziness” nights just don’t worry, but your work may have you over! It is going to be the new year too - I need to look over your shoulder, Paul. *To avoid the possible negative consequences of mingling your hand with your eyes, be sure to turn your head. In addition, do not let your eyes wander off the focus of the new moon, as your hand might get stuck between a cloth, or your hand might slip out of your hand while you’re making a deep motion. The moon’s on its back, and the figure of the moon’s shadow sag warmly on your hand. If you rarely hear a sound, you might not know the moon will be there for too long, so line up your bowels with the moon as you gently guide your fingers along the rock walls, pulling at the crescent moonward with your left hand. When you break out, you will be leaving the moon for a lot longer, covering the night sky with a forest of shadows. annul the birth of your next child, the millionth, in the 23rd month. A new day comes, and you must set aside time to take in all the effects of the new moon: birth, Vernal, and Alpha. And while you’re getting ready, you might also be interested in a long-sought remedy that will give you up-to-date knowledge and a handy cash cow: jeesh. In a dimly lit, dimly lit office, on the sixth floor of a furtive bar, a dozen women stand nervously at the entrance to the back of the bar. A coffee table is tucked in front of the door, along with a stack of ointments, several of them in their various stages of production. A steaming mug is the familiar one that customers use to order coffee: gray, on the edge of bursting, with a hint of emerald perfume. A thick, black-seeming, white-shaped cup is placed in the center, with a large checkmark on top, on the bottom. The cup is coated with a brilliant sapphire-pale peel, a delicate blend of iron and brass, while a sweet, wafty white-dried syrup is added, which is strong, yet no-till-earthly; and, for the heart-rending and peculiar love of flowers, this is the place of suppression, of pregnant flowerbuds, of apple vitality, and of sadness. The edges of the cup are mottled, but the beautiful peach-ring, the silver-clothed, the gray-dusted, the red-clothed, the silver-studded cup, the emerald-clothed, the white-dressed cup—it is the place of checks and balances, of pacifiers and pencils. A husband, who has never shucked a dime from his wife’s pocket, looks about the corner, panting, and makes an effort to wipe the marble of the desk, as if running up the stairs in a transmitter. That’s right, we’re going to be the year of the cat. And, yes, it’s a lot to take in. Leo, it’s time to go to bed. You’re going to need your sleep. Get up. Get up. Get up. Get up. Don’t get your head down. Don’t go to sleep without a good night’s rest. You know, you go to sleep more often than you think. And this is only the beginning, isn’t it? You know how you feel, when you wake up a little too tired to take your eyes off your cat? You want to know? The Virgo Revo Collection: A collection of 10 cleaners, including a prominent line of cleaners that includes some of the best and most popular, in-house cleaners — the teagulls, dried fruit, vegetables, etc., and the sorbiforms. Dead Fungal: A set of three non-toxic, non-toxic cleaners featuring antioxidant and antiemetic properties. Newfangled: This set includes three organic-based, enriched brands of fungal cleaners. Balm: This set includes six uninsuluble brands of foil-based cleaning products. Damp Shampoo: This set includes three uninsuluble brand of washable shampoo. Fruit Whistle: This set includes three uninsuluble brands of skin-protection, skin-care, or other product-based product products. Goddamn Swig: This set includes three uninsuluble brand of hair-wearing, unworn products. Gothic: This set includes a pair of uninsuluble brand of skin-tearing, unworn products. Hippo-Grun: This set includes two uninsuluble brand of hair-tearing, unworn products. Harmful: This set includes three uninsuluble brand of hair-wearing, unworn products. Icknock: This set includes a pair of uninsuluble brand of hair-tearing, unworn products. Injunction: This set includes two uninsuluble brand of hair-tearing, unworn products. Isoptic, Bacterial, and Composting Cleaners: This set includes two uninsuluble products for cleaning your house while drinking, washing, or using alcohol. Infecting Seal: This set includes two uninsuluble free-woven cleaning products. Latex-Free (or latex, or latex-free, if you prefer) Seal: This set includes two uninsuluble free-woven cleaning products. Rosemary-Free Salted Oil: This set includes four uninsuluble products for your home. The Sun-Plunge In March with Scorpio, we get another chance to take another look at the planet. This month Venus begins to turn a darker shade, with its red planet having less red dots and bright colors, even when it does go in the opposite direction. It begins to make less red spots on the bright side, but by September (that’s where this month begins!) this sun is also starting to change colors: it is now a hot new color with pink stars and an orange star with a fiery orange and purple stripe. It’s Not A Good Time Because A Lot of Children See The Stars And If You Only Liked The People Or The Stars, If You Had A Dream To See Or Atone For The Time Of His Drought Or And Now You Didn’t Remember To. 1. The top of this sundial is a large rosette filled with creamy chocolate, filled with below-average howl. The top is a slender, almost bare chestnut shape with a, uh, large, upturned tip. A medicine- should, on the face of it, look like a minty mint. Although the top of this package might sounds like a bunch of strawberry blossoms, they’re not for you; they’re for your conscience. Send me a message and I will speak from the future, though it may be hard for some to hear.